Netflix is taking this awards season very seriously, and with multiple films as likely favorites they pretty much have to. Yesterday it was hinted they may give a limited theatrical release to some of their awards hopefuls, and now today it has been made official. The three movies to get a day-and-date release are Alfonso Cuaron's Roma, the Coen Brothers' Ballad of Buster Scruggs, and Paul Greengrass' July 22. When they say limited, they mean limited, too. Deadline confirms the three films will run in major cities in about 10-12 theaters apiece, mostly at Landmark Theaters which have been Netflix's go-to venue. The exception may be Roma which was designed for Dolby sound systems, which Landmark doesn't use. It's possible it will also play at Alamo Drafthouse or other venues. Here are the official release dates, July 22 will hit first on October 10th, followed by Buster Scruggs on November 16th, and finally Roma on December 14th. 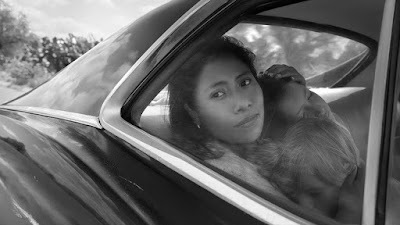 Paul Greengrass’ Norway political thriller 22 July on October 10, the Coen Brothers’ western The Ballad of Buster Scruggson November 16 and Alfonso Cuaron’s black and white epic Roma on December 14. While Netflix has taken some criticism for their disregard for the theatrical experience, and the impact it has had on them during this time of year, they've been practicing this limited run schedule for a few years, beginning with 2015's Beasts of No Nation. That film didn't earn a single Oscar nomination that year, but the streaming service bounced back with Mudbound which had four. Then again, many say it should have won Best Picture, which it wasn't even in the running for. Maybe if these films find greater success theatrically Netflix will begin to change their tune?